SpaceX Announces Plans To Send Two Customers To The Moon : The Two-Way It would be the first time humans have traveled beyond low Earth orbit since the days of Apollo. The mission would be manned and financed by two private, anonymous customers. 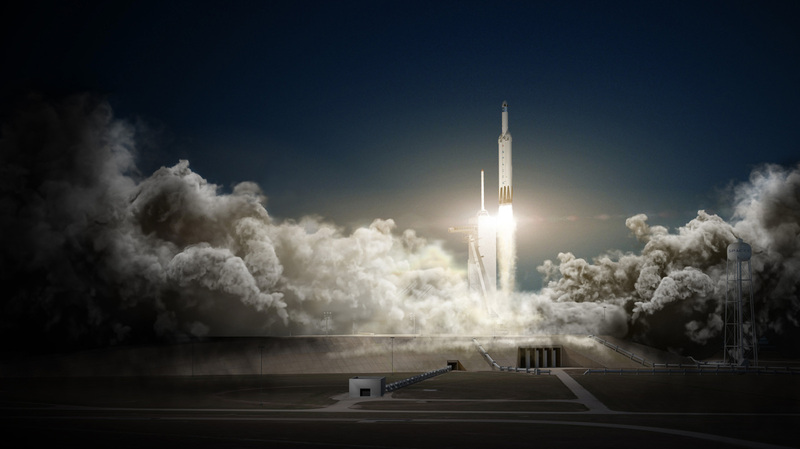 SpaceX says its Falcon Heavy rocket, shown here in an artist's rendering, will be used in the mission to the moon. The private company SpaceX has announced that it plans to send two passengers on a mission beyond the moon in late 2018. If the mission goes forward, it would be the "first time humans have traveled beyond low Earth orbit since the days of Apollo," as NPR's Nell Greenfieldboyce told our Newscast unit. The two private citizens approached the company about the idea and have already paid a sizable deposit, CEO Elon Musk told reporters in a conference call. These private individuals will also bear the cost of the mission. "I think this should be a really exciting mission that hopefully gets the world really excited about sending people into deep space again," Musk said. As the company puts it: "This presents an opportunity for humans to return to deep space for the first time in 45 years and they will travel faster and further into the solar system than any before them." The plan for this private mission is to send the two people to loop around the moon and then return to Earth. They will not land on the moon's surface. As Nell explained, SpaceX "builds rockets and capsules that have taken cargo to the International Space Station for NASA." SpaceX plans to use its Falcon Heavy rocket, which is set to launch its first test flight this summer. Next year, prior to the moon mission, it plans to start crewed missions by taking NASA astronauts up to the ISS. That's a lot of ground to cover before this mission can take place, as George Washington University's John Logsdon, an expert in space policy and history, told Nell. 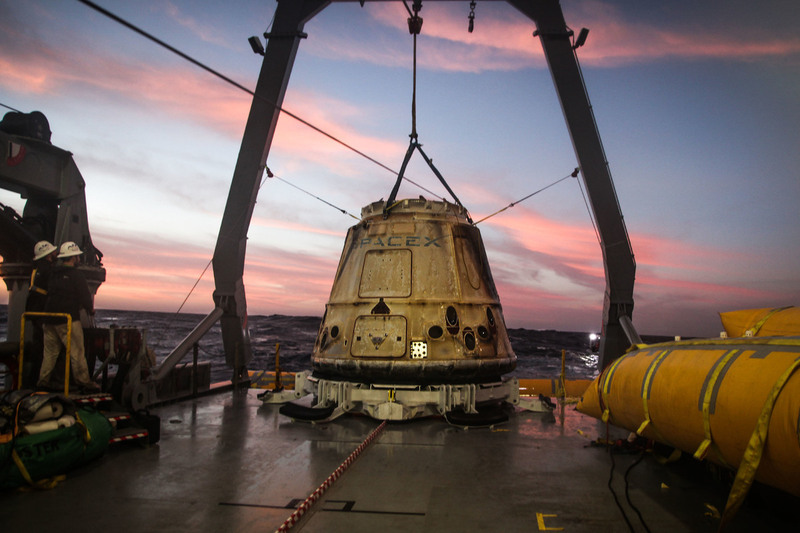 SpaceX regularly flies and returns cargo capsules like the one pictured here to the International Space Station. Now the company says a modified version could take customers to the moon. "Introducing this into the mix raises a fair amount of questions, but it's an exciting prospect," Logsdon said. "SpaceX is notorious or notable, depending on how you want to think about it, for setting very ambitious schedules and usually not meeting them." He added that historically, SpaceX has eventually followed through on what it said it was going to do. The moon mission vehicle is designed to be automated, Musk told reporters, but the passengers will be trained in emergency procedures in case there is a problem. The individuals involved in the mission "are entering with their eyes open knowing that there is some risk here," Musk said. "NASA is changing the way it does business through its commercial partnerships to help build a strong American space economy and free the agency to focus on developing the next-generation rocket, spacecraft and systems to go beyond the moon and sustain deep space exploration." SpaceX has seen some recent setbacks, including multiple delays launching and docking a capsule on the International Space Station earlier this month. It succeeded last week. SpaceX said other potential customers have also expressed interest and it expects to launch further missions. And it's worth noting that this is far from the most ambitious goal that Musk has proposed. Last September, he unveiled plans to colonize Mars by sending at least 1 million humans there to establish a self-sustaining city.